An electric smoker is a sizeable investment and if you want it to last for many years, you need to clean and maintain it properly. Excess build-up of food particles and burned grease can reduce the cooking performance of the smoker. Keeping it clean is easy and all that you need to do is to learn how to clean an electric smoker properly. This will ensure that it works in top working condition for many years. After every use, one of the first things that you need to do is to empty the smoker box so that you can remove the ash. Avoid immersing the box or lid in water. Use a damp cloth to wipe clean. Remember to use mild detergents and non-abrasive cleaning material. The door seal needs to be wiped clean to remove all build-up of smoke residue after each use. Before you start cleaning the interior chamber of the smoker, you need to let it cool completely. The racks, drip tray, water pan and smoker box needs to be removed carefully. If there is any particle build-up you can brush it down towards the bottom of the smoker. Clear all residue out of the chamber. Use warm soapy water and gently scrub the interior surfaces. After you complete the cleaning process, wipe it dry. If you use a bristle brush for cleaning you need to ensure that no loose bristles remain on the surface before you start cooking. The exterior control panel can be cleaned with a clean damp cloth. Use warm soapy water for a thorough cleaning. Wipe the exterior dry. If the smoker has a window, use cleaners that have been approved to clean ceramic glass tops. Most reputed manufacturers provide an instructional manual on how to perform seasoning on your electric smoker and it is advisable to follow those instructions carefully. Even if you don’t have a manual you will be able to do the seasoning on your own. Coat the interior of the smoker with oil. 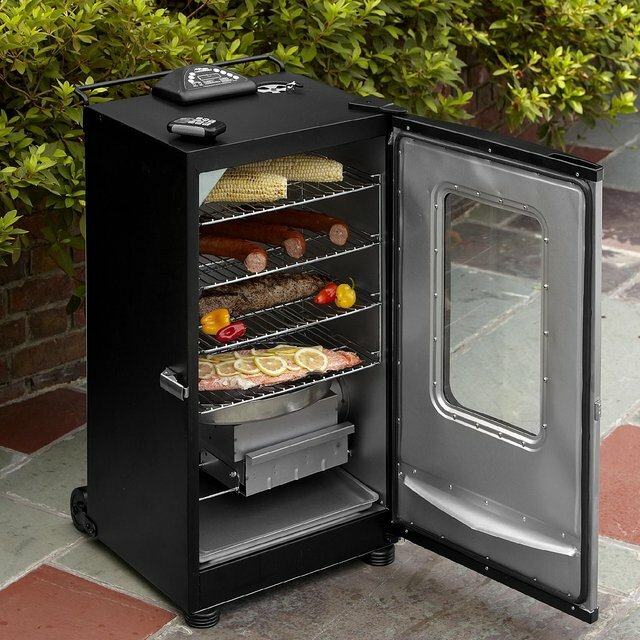 Heat the electric smoker to 250 degrees – 275-degree Fahrenheit. The heat will spread the oil to all parts of the smoker. The oil acts as a barrier against air and water when they come into contact with the metal to prevent rust. A clean ventilation system is crucial for the working of the electric smoker. If it is clogged it can create problems. Always remember to clean the ashes and other debris after cooking or smoking the meat. This ensures that the electric smoker works in an efficient manner. The two thermostats are located on the rear inside wall of the electric smoker and they need to be cleaned regularly. You can use a damp cloth with soapy water to clean the surface of the thermostats. Wipe it dry later. If you want to get the best from your electric smoker you need to clean and maintain it after every use. Remember to plug the unit out of the socket before you start the cleaning process.